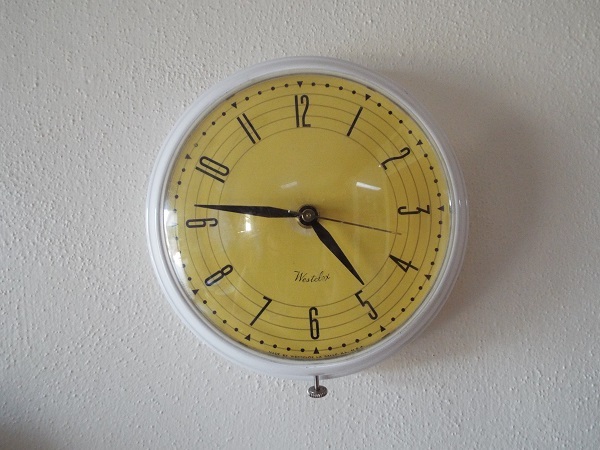 This is a vintage Westclox Manor Kitchen round metal wall clock. Clock has been converted from electric to quartz (battery). Clock measures 7" diameter by 2" deep. White metal round case. Westclox is on the art deco yellow dial. Some scratches on the plastic covering the dial. I think it adds charm. Dial shows some wearing off of the yellow by the number 9 and by the center. Hands are black with a brass second hand and easy to read. Great for the mod or retro kitchen. Clock has a hand set knob on the bottom of the clock, just for decoration. Installed is a new continuous battery movement. The hands move like on an electric clock. The back of the clock is also metal. To change to time or the battery, all you have to do is remove the 2 screws on the back. Included is a new "AA" battery for the movement.